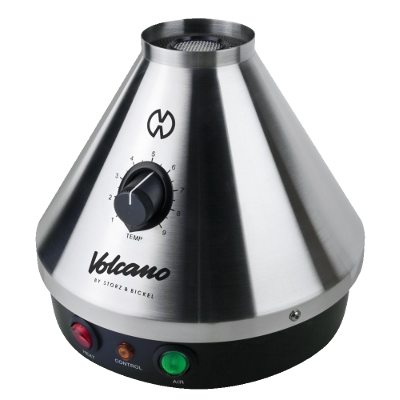 The high quality Volcano vaporization system is one of the best tabletop machines made for vaporizing your botanical, spices and essential oils. Stop looking for a different vaporizer the Volcano System is a solid vaporizer that is built to last you a lifetime. Go for the trusty rock solid Classic Volcano model or for the Digital Volcano model with LED screen and optimal temperature control. 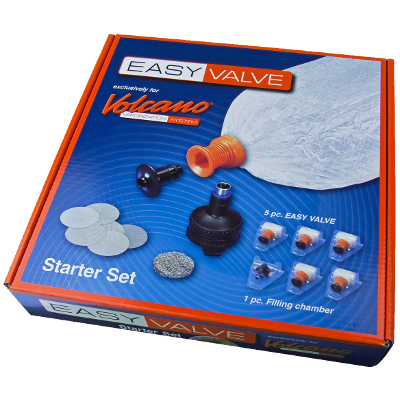 Make your choice between Easy Valve or the Solid Valve balloon system. Choose wise! The Volcano Digit has a digital temperature control system. The hot air generator maintains an exact temperature, accurate within 1.5°C, with automatic switch-off after 30 minutes. The Volcano Classic is a solid stainless steel analog beast, that will feed you vapor for years. One rotary dial button for temperature control makes this table top vaporizer easy to use. It's the vinyl of vaporizers..it will always be there. What is Easy Valve ? TheEasy valve might be a bit more convenient to use wi th a chamber made of two parts and the balloons being preassembled. It requires no cleaning, when it can no longer be used you replace it with a new one. Place the Filling Chamber on the VOLCANO and attach the Balloon. Fill the Balloon with vapor.